Josesito Lopez takes a loss to Keith Thurman by majority decision after 12 hard-fought rounds. Josesito Lopez relishes being the underdog. He’s got nothing to lose and everything to gain against Keith Thurman Saturday night on PBC on FOX. Josesito Lopez has risen to the brink of greatness the hard way, consistently toppling opponents picked to defeat him. Along the way, the 147-pound contender has established himself as an exciting fighter who isn’t afraid to mix it up in the ring in his pursuit of a world title. The 18-year-old Lopez made his professional debut in Las Vegas as a 135-pounder on February 8, 2003, stopping the favored Allen Litzau just 53 seconds into the first round. He was upset in his third bout, though, losing a four-round unanimous decision to Rodrigo Lopez in March 2003. Lopez closed out 2003 with three wins, all by TKO, and continued to climb the ranks the following year, winning all six of his fights to improve his record to 11-1. Lopez began to gain notice in 2005 fighting at 130 pounds, winning three bouts for minor titles. He returned to 135 pounds in April 2006 to face once-beaten prospect Wes Ferguson in Las Vegas, and ended up on the losing end of a controversial 10-round split decision. Josesito Lopez and Jessie Vargas pose at the press conference for their fight in Las Vegas in September 2011. Seven straight wins over the next 19 months had Lopez heading in the right direction, but his progress was stopped again when he lost in controversial fashion to Edgar Santana in Miami in April 2008. Lopez floored Santana twice in the eighth round but dropped a 10-round majority decision. Once again, Lopez stormed back, winning six straight times, although a hand injury kept him from a high-profile fight against Mike Dallas Jr. in April 2010. Lopez finally got his chance against the unbeaten Dallas at 140 pounds in January 2011, and made the most of it, scoring a seventh-round knockout. Lopez was again put to the test against an undefeated prospect in his next fight, facing 16-0 Jesse Vargas in Las Vegas on the Floyd Mayweather Jr.-Victor Ortiz undercard in September 2011. The back-and-forth tumble went to the judges’ cards after 10 rounds, and Vargas emerged the winner in a debatable split decision. Josesito Lopez delivers a right hand during his win over Victor Ortiz in Los Angeles on June 23, 2012. In June 2012, Lopez received the biggest opportunity of his career, as a fill-in opponent against 147-pound title contender Victor Ortiz in Los Angeles. Lopez, an 8-to-1 underdog, broke the jaw of Ortiz, who remained in his corner when the 10th round began, and earned his 30th professional victory. The upset catapulted Lopez into a high-profile fight against undefeated 154-pound champion Canelo Alvarez in Las Vegas one day after Mexican Independence Day. Alvarez overpowered Lopez, knocking him down in rounds 2, 3 and 4 before finishing him off in the fifth round. Josesito Lopez hangs on to Marcos Maidana during their fight in Carson, California, on June 8, 2013. Lopez was an underdog again when he faced Marcos Maidana in Carson, California, in June 2013. 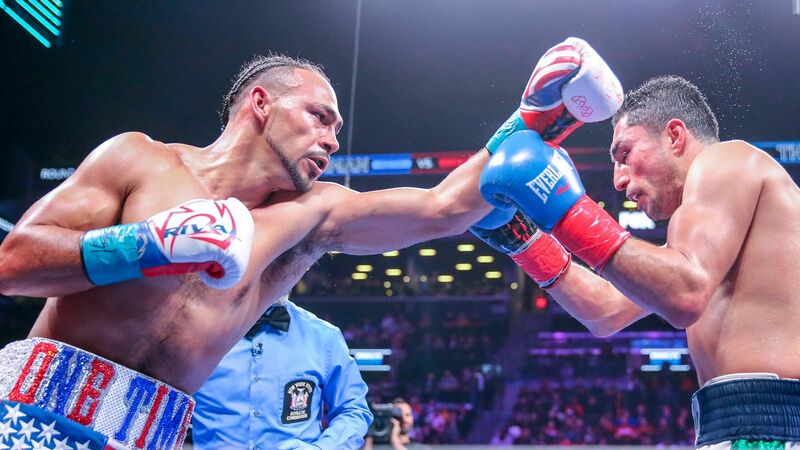 The fighters engaged in a relentless battle, and Lopez dominated the Argentinian slugger in the third and fourth rounds. Maidana knocked down Lopez with an overhand right in the sixth before landing a right uppercut moments later that led to the bout being stopped. Lopez fought twice in 2014, gaining a fifth-round TKO of Aaron Martinez in April before beating Rafael Cobos in an eight-round unanimous decision in Las Vegas in September. Josesito Lopez mixes it up with Andre Berto during their fight in Ontario, California, on March 13, 2015. Lopez received a tough test in his next fight, taking on former 147-pound world champion Andre Berto on March 13, 2015, in the first Premier Boxing Champions card on Spike TV. Fighting before a near-hometown audience at Citizens Business Bank Arena in Ontario, California, Lopez was cheered on by the partisan crowd as he controlled the early rounds of the scheduled 12-round bout. Berto gained the upper hand, though, in the sixth round when he knocked Lopez to the canvas. Lopez returned to action, but only for a few seconds before Berto dropped him again with a right hand, prompting referee Raul Caiz Jr. to signal an end to the fight. Lopez was ahead on two of the three judges' cards at the time of the stoppage.